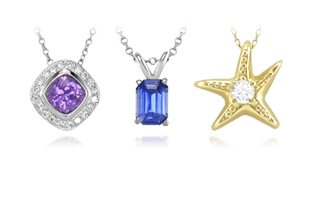 The many distinct elements of men’s jewelry creates special pieces that can adorn any outfit. 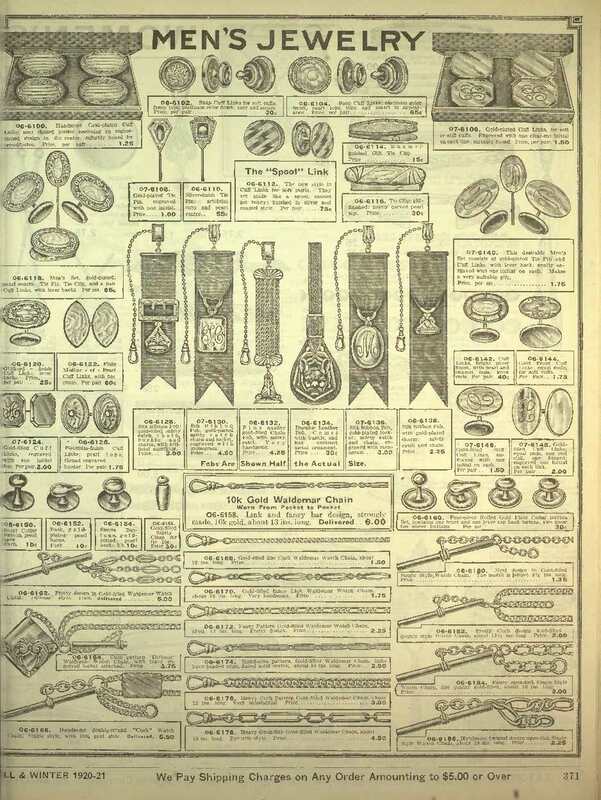 A 1920 ad for various pieces of men’s jewelry including cufflinks and tie bars. 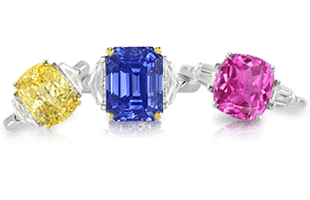 At the beginning of the 20th century, shortly after World War I, men’s jewelry began to outsell women’s jewelry for a period of time. 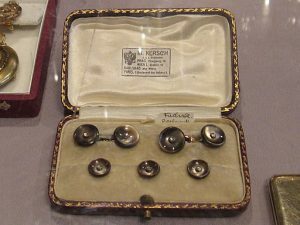 Men’s fashion was changing, incorporating new fabrics with differing weights and ways to be worn, thus necessitating jewelry pieces to hold them in place. The following is a breakdown of some of those essential items. 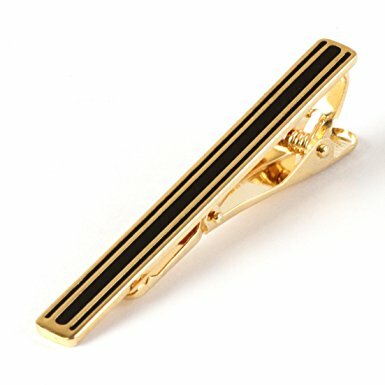 A gold and black enamel tie bar. The tie bar, or tie clip, is fashioned as a rectangular piece of metal that attaches to both ends of the tie and then those are affixed to the placket of the shirt to keep the tie in place. The tie bar opens like an alligator’s mouth via a spring mechanism. 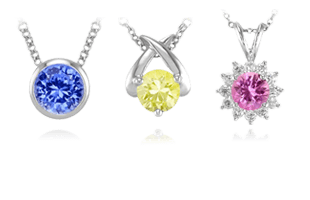 Options for design are virtually endless: they can be placed with a gemstone, or a few ( cabochons are popular), engraved with initials or a special seal, or just be a smoothly polished bar. When worn, it is placed between the third and fourth button on the shirt, and clasped firm but loose enough that it doesn’t pull the tie down. 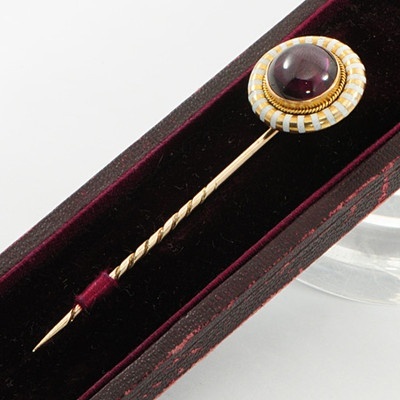 A vintage tie stick pin with gemstone cabochon and filigree finish. The tie stick pin began its use for men in the 19th century when they were used to secure their cravats, a piece of fabric worn around the neck and tucked inside an open-front shirt. The name comes from the single long pin that extends from the ornamental jewelry piece so that it can be pushed through fabric. A protective covering is then slipped or screwed on the pointed end to keep the pin in place and protect the wearer. While rarely seen in every day modern fashion, the tie stick pin is still sometimes used with more formal daywear. A double gold tie chain. 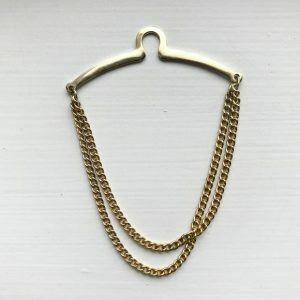 After first appearing in the early 20th century, the tie chain rose to popularity in the 1960s and 1970s when the adopted trend was to have a chain with a loop connecting the ends that latches behind the tie onto the shirt. The front chain would then hang loosely on the tie front. The decoration on the front chain could range from polished metal, to a white pearl or even semi-precious or synthetic stone being displayed. A collar pin worn with a white dress shirt. 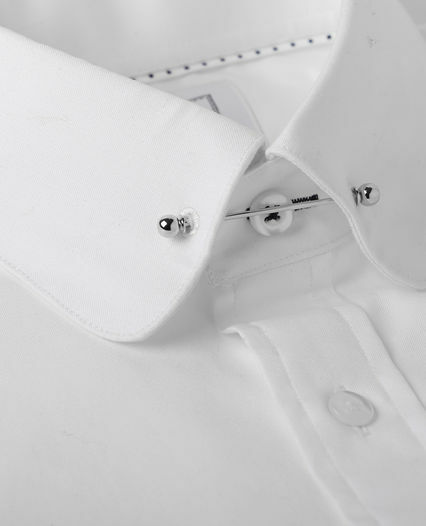 First surfacing in the beginning of the 20th century, the collar pin was designed to help secure delicate silk shirt collars that could not be starched to retain a neat shape. The collar pin would fasten together both sides of the collar behind the tie knot, thus providing the tie with a slight elevation for a sophisticated look. Fred Astaire was a big fan of the collar pin in the 1920s and 1930s, and it has been seen on Michael Douglas as Gordon Gekko in the movie Wall Street in 1987 and the modern television series Mad Men, sparking some resurgent interest. 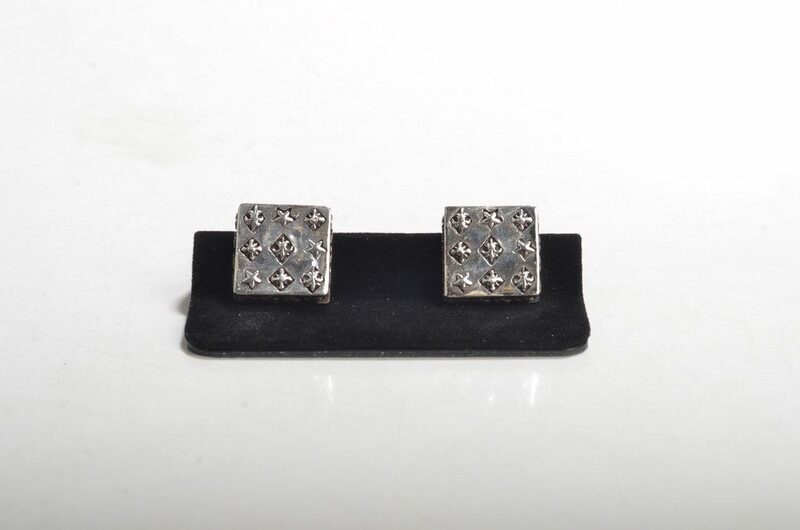 A men’s dress set of cufflinks and shirt studs in platinum. 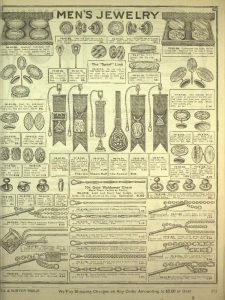 In the early 19th century with the advent of a style of fashion that necessitated fastenings, men’s jewelry pieces developed a sort of uniformity of grouped and complimentary items, similar to a suite of women’s jewelry. 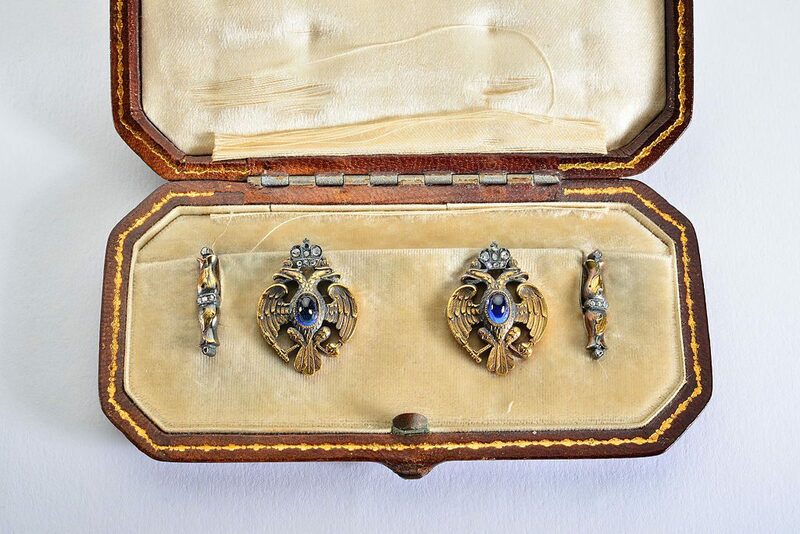 Dress sets were produced by the finest jewelers and represented a high level of class and sometimes wealth, especially if designer cuts were incorporated. A set could consist of any number of pieces, the bare minimum being cufflinks and shirt studs. 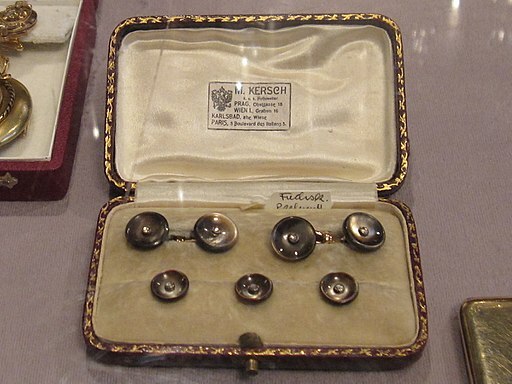 A tie pin and buttons may also be included in the set. 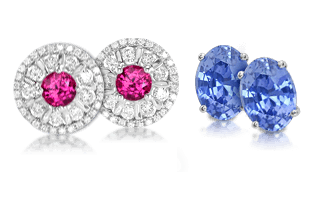 Any type of decoration would be applicable as well, from gemstones to pearls to special seals or polished metals. These styles have set trends throughout history, and next we explore some Famous Pieces of Men’s Jewelry | A Selection from History.